Cloud for Europe supports public sector cloud use as collaboration between public authorities and industry. The project identifies obstacles, finds innovative solutions and builds trust in European cloud computing. Cloud for Europe uses pre-commercial procurement as an instrument for public sector innovation. The pre-commercial procurement identifies innovative solutions for cloud services that best fit public sector needs, but also provides better information to public procurers about the potential of cloud services. The project started in June 2013 and runs until November 2016. It is co-funded by the European Commission under the Framework Programme for Research and Innovation (FP7). The SUCRE project is driven by a key objective, which is the consolidation of the European Cloud Computing and Open Source communities by creating a critical mass of stakeholders who will work together on promoting the use of Open Source in Cloud Computing. Indeed, it is an FP7 project addressed to collect interoperability issues from Cloud services and applications, aimed at establishing and contributing to the use of standards. eEnviPer is an integrated web-based platform for the application, administration and consultation of environmental permits. By making the environmental permits process more transparent, accessible and efficient, eEnviPer helps to reduce the environmental impact of economic activities through the environmental permits process in a cost-effective manner. Economic activities with substantial environmental impact – from wind farms to nuclear power plants – need permits from their local or regional authority. eEnviper brings this process into the 21st century and provides an integrated web-based platform for the application, administration and consultation of environmental permits. The pilots in Puglia (Italy), Crete (Greece), Niğde (Turkey), Indjija (Serbia) and Krapina-Zagorje (Croatia) integrated existing governmental data sources and geographical information systems with Web 2.0 participation platforms and workflow solutions. The resulting single multi-purpose cloud platform, based on service-oriented architecture, is now available to authorities across Europe as software as a service (SaaS). As of April 2014, the eEnviPer software solution is commercially available in Croatia, Italy, Greece, Serbia and Turkey and the identification of future opportunities is underway. In June 2014 DRAXIS SA (Coordinator) signed a contract with the Greek Ministry of Environment, Energy and Climate Change for the implementation of the eEnviPer solution for the Greek region. The full implementation of eEnviPer for the Greek environmental permitting procedures is expected to be realized in autumn. Moreover, after discussions with the local partner in the Republic of Croatia they have presented the eEnviPer solution to the Croatian Ministry of Environmental and Nature Protection looking forward to a future collaboration. The Croatian Ministry expressed their interest to implement the eEnviPer solution for their region and so they submitted their offer for consideration. Open-DAI (Opening Data Architectures and Infrastructures of European Public Administrations) is a project funded under the ICT Policy Support Programme as part of the Competitiveness and Innovation Framework Programme (CIP) Call 2011. The project aims to make data and platforms available for digital public services on cloud computing infrastructures. This means that open data can be used as a starting point to create new applications and services for public administrations, companies and citizens or to provide a channel for feeding back information to public administrations. The Open DAI project is scheduled to run for 32 months (February 2012 – September 2014), is worth . 3,200,000 and involves 11 partners from Italy, Spain, Sweden and Turkey. SEED is a project bringing administrations and citizens closely together through a more immediate, economic and efficient communication. It’s a cloud-based platform between the administration and its citizens, providing access to all public sector information (open data) through a network of information points such as digital displays. It can be accessed through any type of digital node anywhere with an internet connection. 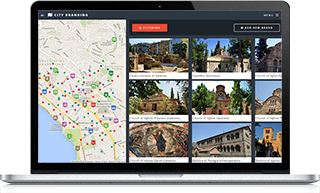 SEED gathers any content at your interest in the simplest way: e-Gov, employment, health, tourism… In a few words, it transforms Public Sector Information into Public Sector Advertising to raise citizens’ awareness about the public services available to them. A future-oriented project that is adaptable and scalable to all EU administrations. Based on the collaboration between civil servants, public authorities, citizens and business, the CLIPS project develops a new approach to the delivery of public services through the use of the cloud. 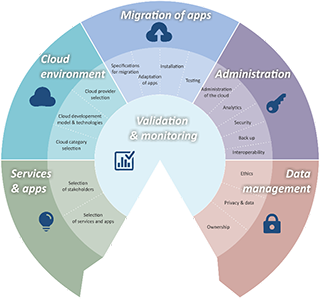 Its principle goal is to provide a framework that can be used for the implementation of cloud based public services which seeks to overcome major issues associated with cloud adoption notable in architecture design and security. The definition and the implementation of new services follows a mash-up approach, to develop an ecosystem template (methodology and tool kit) where services are defined specifically for the benefit of a municipality, that can be reused across the EU. Based on a fictional scenario of a family moving from one member state to another and the associated complexities that this involves, the project seeks to demonstrate how cloud services could be used through the delivery of four pilots in four cities: Bremerhaven (DE), Lecce (IT), Novi Sad (RS) and Santander (ES). CloudOpting aims to deliver a set of tools that will allow local authorities and public administrations to share their services with citizens and third-parties and migrate existing IT systems on the cloud, in order to reduce investment and expenses as a result of an aggregate demand, and the measurement and control of costs. CloudOpting intends to enhance the adoption of cloud platforms by stimulating a change of practice in public authorities and thus enable efficient and transparent services as well as new market applications to private companies and citizens. The framework will be tested in pre-commercial pilots deployed and experimented in three European regions and cities – Barcelona (Spain), Piedmont (Italy), and Corby (UK). The results and conclusions related to these experiments will contribute to establishing common strategies, methodologies, standards and innovative cloud-based services through an open platform. The European Cloud marketplace for Intelligent Mobility (ECIM) aims to encourage collaboration between the public and private sectors in cities, bolstering pan-European innovation and contributing in the development of smarter transportation services. Citizens can effortlessly access and use innovative services anytime, anywhere. The main goal of STRATEGIC is to enable, pilot and evaluate a radical shift in the way public cloud services (and existing online services) can be migrated, replicated and reused across different regions, as well as in the way they can be used in the composition of novel services. STRATEGIC will contribute to: the provision of more effective services for citizens and enterprises, give public administrations the opportunity to benefit from the experience of other public entities, to provide cost-efficient and improved quality electronic services, and offer the technology community a secure framework for the migration of online public services to cloud. VIRGO intends to realise a cloud virtual registry of the existing infrastructures in several European countries with standardized system to store and manage data in a unique manner. It will develop procedures for the maps preparation and the regulatory provisions to create the registry on cloud and implement and deliver related services. Also, VIRGO will optimise the virtual registry with the results of three pilot initiatives in Italy, Portugal and Romania and will disseminate the system and the related results throughout Europe. Started in November of 2013, CloudWave is a three year program sponsored under the auspices of the European Union’s FP7 initiative. Led by the IBM Haifa Research Lab, CloudWave features ten partner organizations and has a budget of over 6,000,000€. Inspired by the emerging concept of DevOps for reducing application development time, CloudWave is developing a next generation Cloud stack where the Cloud infrastructure and hosted applications transparently collaborate to obtain high levels of service at lower costs. Additionally, insights from powerful analytics on the behavior of services running on the Cloud will be fedback to developers to allow them to shorten the develop cycle time required to improve and extend these services. ClouT is a collaborative project jointly funded by the 7th Framework Programme of the European Commission and by the National Institute of information and Communications Technology of Japan. The ClouT consortium is a strong partnership of leading European and Japanese industry as well as universities and research centres. ClouT’s overall concept is leveraging the Cloud Computing as an enabler to bridge the Internet of Things with Internet of People via Internet of Services, to establish an efficient communication and collaboration platform exploiting all possible information sources to make the cities smarter and to help them facing the emerging challenges such as efficient energy management, economic growth and development. ClouT will provide infrastructures, services, tools and applications that will be reused by different city stakeholders such as municipalities, citizens, service developers and application integrators, in order to create, deploy and manage user-centric applications taking benefit of the latest advances in internet of things and cloud domains. ClouT with its user-centric approach, will also offer to end-users the possibility of creating their own Cloud services and share them with other citizens. The vision of S-CASE is to provide tools for developers, along with the underpinning technologies that will support the insertion of rough system requirements in a variety of structured, semi-structured or unstructured formats for seamlessly generating draft software prototypes that will form the basis for complete software development. S-CASE is seen as a rapid prototyping realm aiming at providing automated solutions for (a) the extraction of system specifications and low-level architecture, and (b) the discovery and synthesis of composite workflows of software artefacts from distributed open source and proprietary resources that fulfil the inserted system requirements in the best possible way. Through the innovations it introduces, S-CASE is expected to have a significant impact on the reduction of the time that is required between the conceptualisation of a software system and its first prototype, thus improving the SE process in terms of development costs. (a) Cloud and application performance metrics collected and cost-evaluated through a scalable monitoring system and exposed to the user. (b) Qualitative and quantitative characterisation of the application‘s performance through modelling of its elastic properties. programming development environment (through a distributed tool to enable developers, administrators and users to define the characteristics of their applications, deploy them, and monitor performance). The outcome is a modular, completely open-source system that offers elastic programmability for the user and automatic elasticity at the platform level. This outcome can be bundled in a single software package for one-click installation of any application alongside its automated resource provisioning over a Cloud IaaS. Two exemplary applications that showcase and validate the aforementioned technology will be developed: The first will showcase the use of CELAR technology for massive data management and large-scale collaboration required in the on-line gaming realm, while the second will focus on the area of scientific computing, requiring compute- and storage-intensive genome computations. CACTOS delivers three major results. CactoScale: A set of tools and methods to acquire and analyse application behaviour and infrastructure performance data. CactoOpt: Mathematical models and their realisation to determine the best fitting resources within a provider context. CactoSim: A prediction and simulation environment for diverse application workloads. Modern offerings go beyond simple services, including full platforms, complex compositions and whole infrastructures. 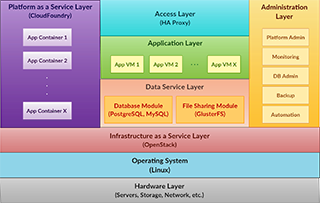 This leads to a significant complexity in mapping the different modules of these solutions on the large variety of available hardware options. Similarly data centres have made significant investments in energy efficient buildings, server racks and facility management technology and understand themselves as Smart Consumers in evolving SmartGrid environments. To cope with the challenge to optimise the mapping of services to a variety of different resources, both hardware and software related (e.g. high bandwidth demands), requires topology aware mapping. This mapping needs to consider placement of the services across geographically distributed centres and demands new intelligent and cross-domain integration of actual and historical usage data. CloudWATCH will support the European Cloud ecosystem, through www.CloudWatchHUB.eu, a pan-European cloud observatory. CloudWATCH will help drive awareness and adoption of cloud computing in Europe, supporting the European digital market. It will provide independent and practical information, helping users in all sectors understand and evaluate the benefits of cloud computing. CloudWATCH will leverage its extensive partner networks and large, networked community, broadening consensus on the most relevant standards for interoperable services and solutions, as well as fair and transparent certification. Through www.CloudWatchHUB.eu, CloudWATCH will also ensure a sustainable platform for assets coming from EU investments in R&D. The service ecosystem approach will promote open-source, interoperable services resulting from European initiatives, helping to transform the way they typically communicate their R&D. SeaClouds performs a seamless adaptive multi-cloud management of service-based applications, by developing Cloud Service Orchestrators and a set of tools to manage complex applications, thus avoiding the problem of Cloud lock-in. This will be achieved by supporting the migration, replication, and distribution of modules that compose cloud-based applications over multiple and technologically diverse Clouds offerings, by using a unified management API and universal metrics for monitoring and verifying functional and non-functional properties. CloudingSMEs intends to act as a catalyst for the accelerated and more successful adoption of cloud computing by European SMEs, while at the same facilitating ICT SMEs in the development, deployment and promotion of their cloud computing solutions. CloudingSMEst takes a comprehensive approach to the use of cloud computing by SMEs, which considers both the supply side (i.e. results and endeavors of ICT SMEs with expertise on cloud computing) and the demand side (i.e. the adoption and use of cloud computing technologies by SMEs). Along with the production of the road maps, the project will focus on short, medium and longer-term activities, which shall be undertaken by the SME communities, cloud computing communities and policy makers towards a smooth and successful migration to the vision. CloudSpaces Services. Resulting software, StackSync is a scalable open source Personal Cloud that implements the basic components to create a synchronization tool. CloudCatalyst aims to provide useful tools to foster the adoption of cloud computing in Europe. The project will set up a cross-border advice and support service, contributing to strengthening European position in the Cloud Computing market, including both the European business software industry and the individual citizen and consumer.